Our handcrafted classic 45' Ketch is elegance on the water. Built for the journey and not the destination, she and her team will treat you to a front row seat to the most spectacular natural events in Puerto Vallarta. Featuring 2 masts, she is designed for quiet trips where you can relax and enjoy the boat in every sense. 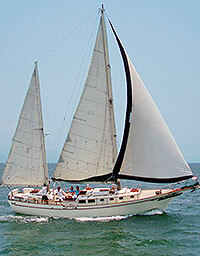 This fine sailboat is available for luxurious private charters for groups of up to 20 passengers. You can do snorkeling and kayaking or just a trip to see the sunset, enjoy sailing by day and relax or have a gourmet dinner served on the boat, we can create the option you need. You decide you want to do, will make it a trip of 5 stars. What really sets this lovely vessel apart is the gourmet cuisine that it is known for - both on day sailing trips and dinner cruises. It's a great chance to get away from it all and have some real fun! Runs:Daily. Full Day Trips Start at 10:00 AM. Sunset Cruises Start 5:00 PM (winter) or 6:00 PM(Summer Time). Departs From: Marina Vallarta and Nuevo Vallarta. Directions will be provided with your confirmation. Duration: Full Day (6 Hours) and Sunset Cruises (3 Hours). Sunset VIP Cruise Only: If you wish, you can choose four appetizers from the "Sunset Menu" instead of the VIP Dinner. Tomato Tapas: make it with tomato, garlic and red bell pepper. OR you can choose dinner from the VIP menu instead. Full-Day VIP $1195.00 $119.00 ea. Full Day Classic $895.00 $89.00 ea. Sunset VIP $1095.00 $105.00 ea. Sunset Classic $895.00 $89.00 ea. and pay the rest the day of the tour. We will collect a 50% deposit for up to 10 people at the time of booking. The remainder will be paid in cash on the day of the tour. Any instructions such as where you want to go, what you want to see, menu selections, what you'd like your itinerary to be and any special requests or instructions for us. VIP 5-Star Menu: Please type your choice of main courses into the special instructions box when booking. Desserts are always seasonal surprise!! A spectacular variation to satisfy any sweet tooth!